It seems to me that it is time for another such article. The village of Fishkill Landing was located along the east bank of the Hudson River, about fifty-nine miles north of New York City. It was one of the original communities in the state, dating back to the early 1700s. 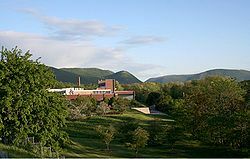 During the American Revolution, soldiers set signal fires that blazed from the summit of Mount Beacon, alerting the Continental Army about British troop movements. 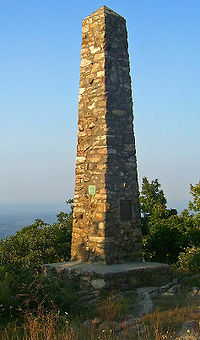 In 1901 the local chapter of the Daughters of the American Revolution erected a monument at the site of these fires, near the mountain’s summit. During the 1800s, the city became a factory town and was known as “The Hat Making Capital of the United States,” with nearly fifty hat factories operating at one time. In 1880 workmen discovered immense deposits of clay, and a brickyard was established that lasted fifty years. The merger became effective three years later, in 1913. As predicted in the New York Times of 1910, the names of the two villages disappeared, to be replaced by a new name, “Beacon.” This name honors the beacon fires that the soldiers set during the American Revolution. The glass shown above is definitely a pre-prohibition glass. How do we know? The Eighteenth Amendment (and with it, Prohibition), went into effect in 1920. 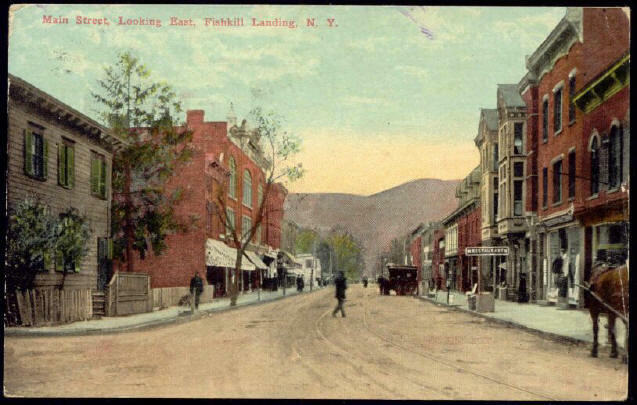 The disappearance of Fishkill Landing in 1913 was seven years prior to Prohibition. Thus, it seems reasonable to conclude that this glass can be dated to a pre-pro time of 1913 or earlier. The city of Beacon took an economic downturn that lasted from about 1970 to the late 1990s, during which time almost eighty percent of the city’s commercial business spaces and factories became vacant. But beginning in the late 1990s, with the opening of one of the world’s largest contemporary art museums, Dia: Beacon, the city began an artistic and commercial rebirth. Actor Robert Montgomery was born in Beacon, as was Notre Dame basketball coach Digger Phelps. Actress Helen Hayes lived here, as did singer Pete Seeger. A scene from the 2005 movie, War of the Worlds, was shot in Beacon. 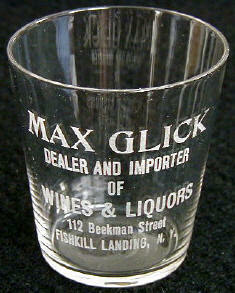 Max Glick’s store was on Beekman Street. This early view of Main Street provides a good indication of what Beekman Street might have looked like when Mr. Glick operated his business. Copyright © 2009 pre-pro.com. All rights reserved.